As part of a Spring research residency and collaboration at Hyde Park Art Center, Chicago-based artist Susan Giles and Manchester-based artist Sally Morfill will respond to their shared interest in the visual language of co-speech hand gestures, and make new work that has conversational dialogue at its heart – both as subject and method. Their aim is to make visible the fleeting gestures visitors make when asked to describe their experiences of moving through the Art Center building or their recollections of present and past exhibitions. 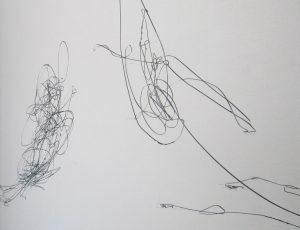 Using motion-capture technology to record these movements; a selection of visual representations of these captured gestures will be presented in Gallery 5 through possible wall drawings or 3D printed objects that make visual the material traces of the meetings and conversations that took place. Found Gestures will travel to Five Years Gallery in London in June 2019.